I have another installment of the gifts for my handmade birthday club members to share with you today. This is a mini quilt that I made for Jamie. Jamie had given us a great list of suggested fabrics and color schemes along with a link to her pinterest boards. While perusing her quilt board for ideas, I came across this chevron fly block that I thought would be perfect for a mini quilt. The best part is that the block is that it’s made up of half-square triangles- so easy! I played around a lot with layout and color but in the end decided to go with shades of gray with a pop of this alison glass feathers print for color. Once I made the chevron portion, I improvised the rest of the quilt top- putting the different ideas up on my design wall until I settled on varying widths of the fabrics for a bit of a stripe effect. 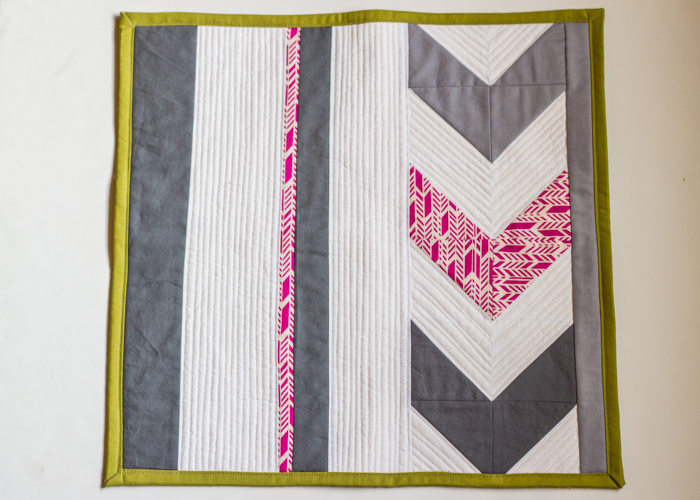 I backed the quilt in some geometric print that I had in my stash and did matchstick straight-line quilting on the white sections of the quilt to make the front design pop even more. 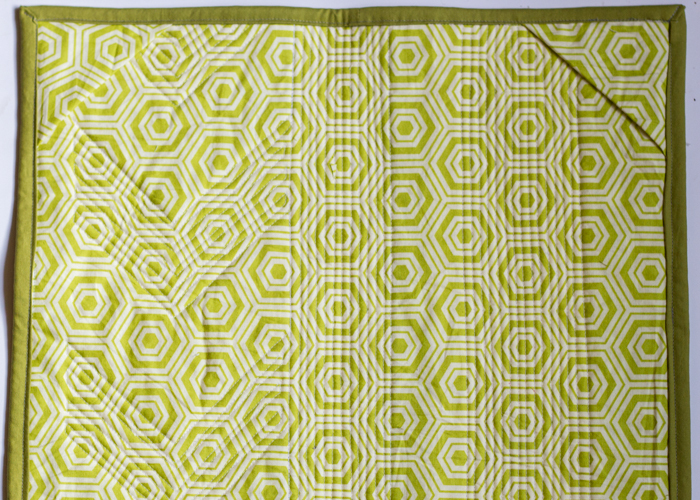 I bound the quilt in Kona Olive which I just recently picked up thanks to Kristin continually lauding its ability to coordinate with any project. I have to say I might agree with her. Love extra color pop it added to my mini. And I promise the binding looks better than it appears in these pictures. For some reason it looks super wavy in the pics but it wasn’t in real life! I just recently got two of my half-birthday presents in the mail from my fellow birthday club members and one of them put these great envelope sleeves in the top of a mini quilt. I hadn’t thought to add that little detail before so I decided to try it out on this one and it was quite easy and will make it much easier to hang! I had a leftover chevron piece so I made a quick little zipper pouch out of it and added some fun office supplies to finish up my birthday gift. I really love how this turned out and hope my recipient loves it as much as I do! 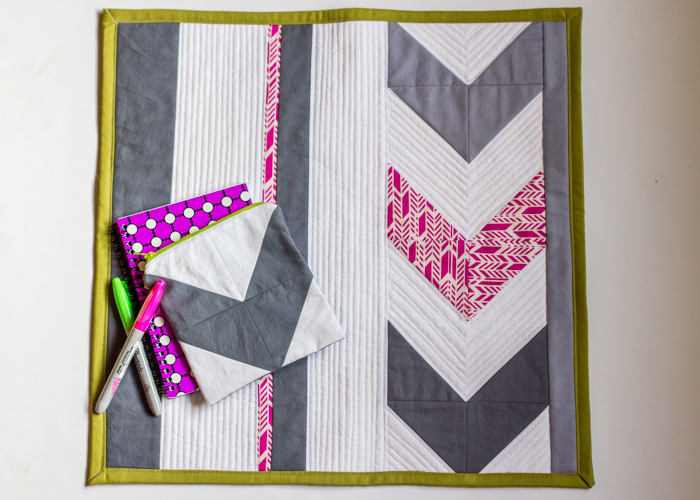 This entry was posted in Gifts, Quilts and tagged chevron mini quilt, handmade birthday club, mini quilt by oliver's fancy. Bookmark the permalink. thanks! I never would have thought of kona olive if you didn’t use it all the time but now I’m loving it.